Richard Hopkinson Architects, working in collaboration with Platform 5 Architects, achieved a prestigious award for this £40m project, designed for LeSoCo College, a scheme with a neighbouring 44 home development in the Cut, Southwark Lewisham. LeSoCo gives students the feel of a modern workplace, setting them up for progressing into work, or to university. The first phase was the housing development. Balfour Beatty built the 29 homes and 15 affordable units, arranged in a mixture of studios, apartments and townhouses in two separate blocks on either side of a new pedestrian route, named New Marlborough Street, that runs through the city block. These were subsequently sold to support the college’s redevelopment. The second phase of the design consisted of a six-storey education building, built containing a flexible teaching space, a reception and café connected to the college’s existing facilities. Within the scheme is a rooftop terrace which offers stunning vistas over London including views of the London Eye, Big Ben, St Paul’s Cathedral and The Shard. The seating area on this terrace is set behind a glass screen, providing shelter with an exterior space for socializing. 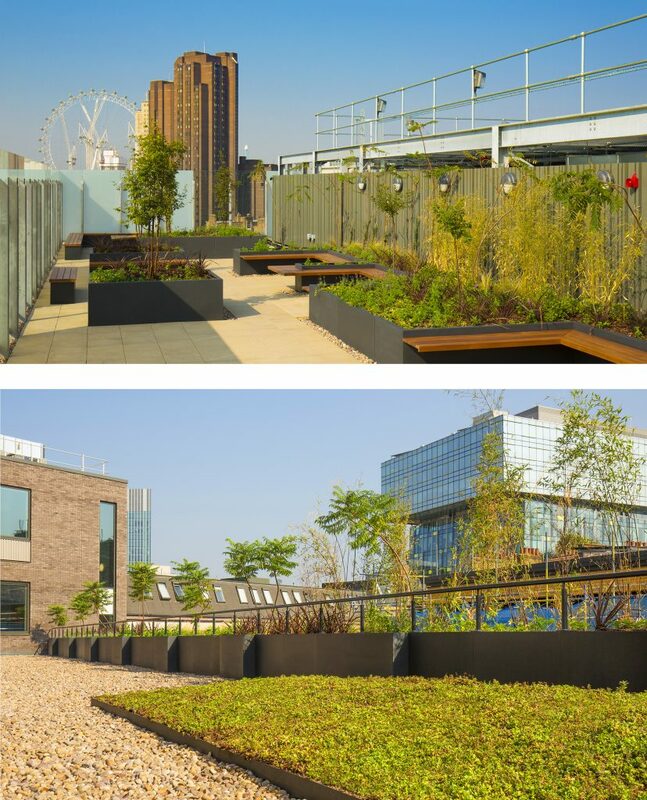 To ensure that there is a green space Europlanters manufactured 24 metres of floating seat planters for trees and shrubs, another 11 meters of planters with seating on the top and a bespoke triangle shaped seat, so that people visiting the roof top can sit and enjoy the city skyline. The planters were produced in RAL 7021 Matt to compliment the exterior of the building and Sapele was the hardwood timber used for the seating. Europlanters worked closely with landscapers from TCL group who planted up small shrubs and trees before adding the seating to the planters. 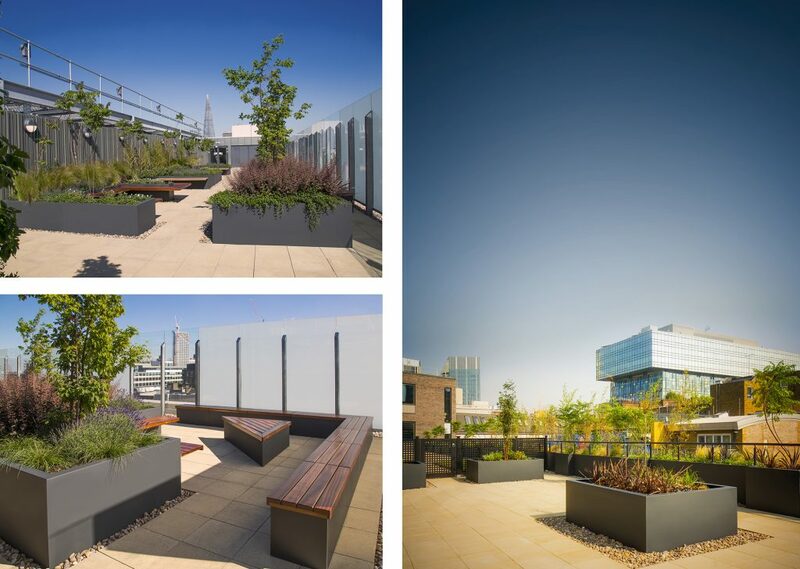 On the terrace of level two, to ensure safety for people using the area, 60 metres of planters were made with strong metal balustrades, powder coated to the same RAL colour as the planters, to create a barrier at the edge of the roof terrace. ‘Adding balustrades has been a new, exciting challenge for us’, said John Wilkes Director of Europlanters, ‘it’s the first time that we have created a guardrail on planters – and we have tested it way beyond the necessary limits to ensure that it’s fit for purpose’. To add to the green space, two very large sedum trays were created in GRP which were then bolted together and planted up by the TCL group. LeSoCo opened its doors to young people and adults wishing to further their education in summer 2016.